Europeans Blaze the “Bike Trail” for U. S.
Little did I know when my Dad gave me a subscription to the Wall Street Journal for Christmas that it would become my top source for “Green” news. First there was the challenge to the conventional wisdom about ethanol, then there was Denmark’s road to energy independence, now it’s European promotion of bicycle travel. Communities in Europe have long been big believers in bicycles. 40% of commuters get to work by bike in Amsterdam and more than 33% of commuters use bicycles in Copenhagen. Now other communities are striving to reduce gasoline consumption and carbon dioxide emissions by working to increase bicycle commuting. Norway plans to raise bicycle traffic from 4% to 8% of all travel and Sweden is working to move from 12% to 16%. For many European bicycle commuters, it’s not all about green goals. Many bike riders cite burning calories or clearing heads as their motivation for leaving their cars at home. A number of American cities are also working to increase bicycle commuting. However, there are sometimes pockets of strong opposition to creating bike lanes, narrowing driving lanes or reducing speed limits. In spite of the cultural challenges, there are some notably bike friendly cities in the U. S. 21% of commuters get to work by bike in Boulder, Colorado and 17% of commuters use bicycles in Davis, California. In nearby Madison, Wisconsin, an estimated 20% of downtown commuters use bicycles to get to work. There’s even some movement toward increasing bicycle commuting in Northfield. At Monday night’s Council Meeting, a resolution to establish a task force on non-motorized transportation will be considered by our community’s leaders. Ross, you didn’t reference my previous post (although it was some time ago), which had a link to another great page about bicycling in Copenhagen. It’s worth checking out! …your previous post is definitely worth checking out! Ross, Thanks for highlighting the benefits of cycling, and thanks to you and the Wall Street Journal for noting the strength of the cycling culture in Europe! And as Bruce Morlan (see blogger list to right) has pointed out, some of the cities with strong cycling cultures have cold winters – cities such as Muenster, Germany, and Copenhagen. Ross has mentioned my blog post on a new Northfield Nonmotorized TransportationTask Force in another comment, but I thought I’d mention it again. It lists the mission and goals of the task force. The bike pictured above is a Dutch “Bakfiets” or cargo bike, which might have some advantages over a bike with trailer. 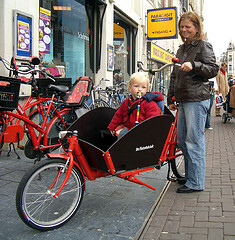 See the company website at http://www.bakfiets.nl/eng/.